Welcome to My Creative Time's 44th Release! Totally love these doily dies, there are 4 different sizes!! They also come with a die which you can use to make button holes, I used it for the button on this project, so cool. What a beautiful card! Love the colors! The doily dies are super cute! Your card is so elegant and lovely! Beautiful card. I like how you used several dies on your card and your color combination is awesome. OMG Your card is absolutely Gorgeous WOW!! 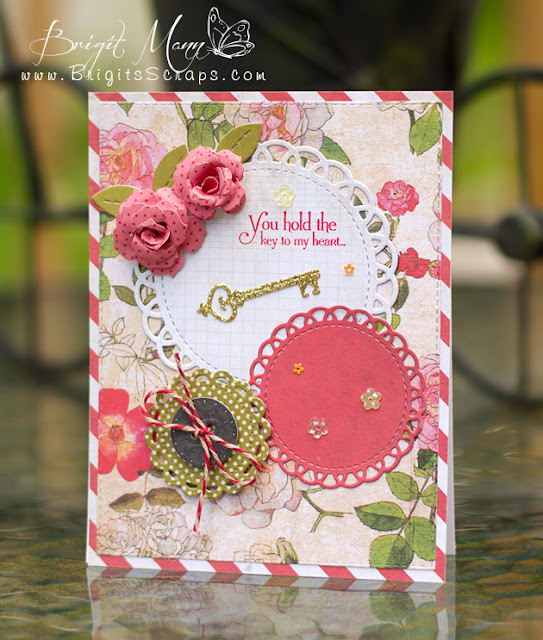 I love the elegance of your card and the outstanding creative ways you've used all of Miss Emma's goodies. The paper you chose is so beautiful. I am in love with these new doily dies. I have to mention too your flower turned out so pretty. Very pretty use of paper and design. Brigit your card was my favorite for today's sneaky peeks. the combination of colors is beautiful! Absolutely beautiful! Love the romantic feel of this card! Absolutely gorgeous! LOVE the papers and pretty design! I am sure it is going to be another fantastic release! Very pretty and feminine card. Love the contrast of the stripe paper as a border behind the floral background. These doily dies are really great. Beautiful card, really like the soft colors!! Beautiful papers and I love the doily dies sneaked today. Your card design is beautifully done...love the flowers. Great job. Gorgeous card!! I love how you did a great job putting it all together. The embellishments are pretty and perfect too! Awesome job! Such a beautiful card! Love the way you used the doily dies and the color combination of your paper and flowers. Very well done!! Lovely card with beautiful colors! I love the different edges on the doily dies, and your pretty layering! Super cute card, great color combinations. Love the new dies! Great card! Love the doily dies! So fun and the cute flowers added were perfect! The dies and papers you used go together so well. Such a pretty card. I love how the flowers and the doily pick up the pinks in the background. I love your card, beautiful dies and I love the flowers. Beautiful card design with the doilies and flowers. I'm over the moon for these dies! Love Emma's existing die and this is the icing on the cake! Your card is gorgeous! Truly stunning color choices. Lovely card with all the perfect elements to showcase those great new stitched doily dies. What an elegant card. Love how you use the doilies on your card. Brigit , your card is exquisite!!! This is simply Beautiful Brigit! Have a Crafty Day!!! My Creative Time 44th Release Blog Hop!